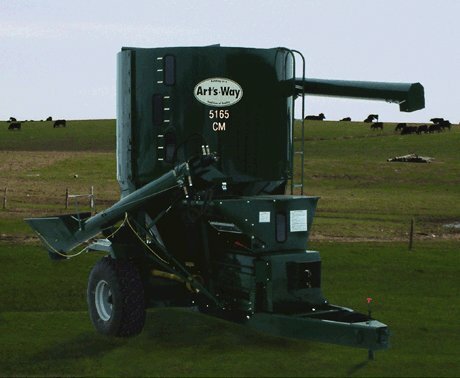 The Art's-Way Cattle Maxx offers today's beef and dairy operations rolled feed in a quality and consistant ration mix. Both 20 and 30 inch heavy-duty rollermills are available with 10 inch diameter 5, 7 or 10 groove flat or sharp rolls. It is available in either 105 or 165 Bushel capacity. Lower horsepower requirements of the rollermill provide greater economic mill efficiency. Both flat or groove roll designs are available. The flat groove roll insures proper grain crimping or cracking. Sharp groove rolls increase mill capacity while achieving desired micron particle sizes. HP requirement 40 to 100 h.p. 60 to 130 h.p. Approx. Weight with Auger Feeder (1606 kgs.) 3540 lbs. (2041 kgs.) 4500 lbs.